Regional gardeners are learning to appreciate native pollinators, in part due to the activities of National Pollinator Week (the 3rd week in June). While most people think of bees when they hear the word ‘pollinator’, in fact a wide range of animals function as pollinators. To learn more about pollinators in general see our June 2013 posting (http://mother-natures-backyard.blogspot.com/2013/06/life-friendly-gardening-planning-for.html). Many species superficially resemble bees; hence the common name ‘Bee Flies’. Their bodies tend to be compact and dense (like a bee) with a rounded head; their coloration may also mimic that of bees. However, Bee Flies differ from bees in several important ways: 1) a single pair of wings (bees have two pairs) held in a characteristic, swept back (‘bomber’) position when perched (see above) ; 2) no stinger; 3) very large, compound eyes (compare above); 4) segmented antennae; 5) mouths adapted to sucking; 6) long, thin legs (see above). Bee Flies usually are black or dark gray in color, sometimes with yellow, gold or white. Their segmented abdomens (the ‘tail end’ part of the insect) may have alternating dark and light segments. They also tend to be hairy; prominent hairs are often visible on head, thorax (mid-segment) and abdomen (see photo above). Adult Bee Flies feed on nectar and (sometimes) pollen. In fact, many have mouth parts adapted for feeding on a particular species/group of plants (an example of specialization). Many have a long proboscis (tube-like, sucking mouth part) for sipping nectar. Unlike a butterfly proboscis, which is slender and uncoils for feeding, the Bee Fly proboscis is stout and rigid. You can often observe it in a good photograph of a Bee Fly. Unlike bees, Bee Flies often don’t actually land when feeding. They hover above the flower, steadying themselves with their front legs. In fact, the front legs in some species are notably shorter and more slender than the other legs - an adaptation to hover-feeding. 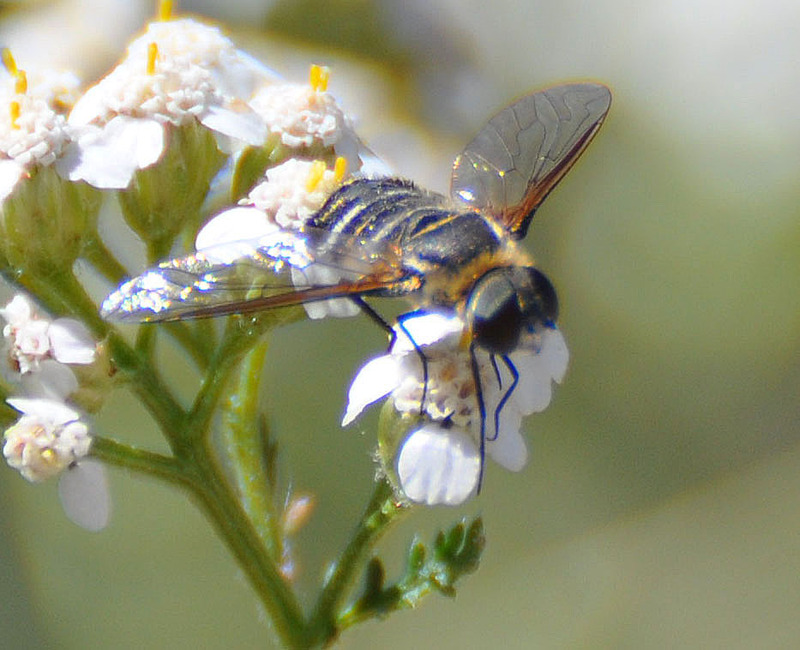 This hover-feeding behavior may be the first clue that you’re observing a Bee fly, not a bee. 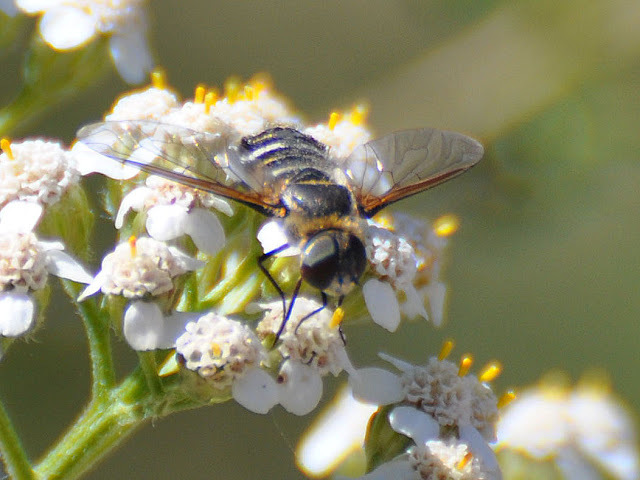 While not as specialized as the bees, Bee Fly species are thought to be important pollinators, particularly in dry climates. Their frequent visits to flowers and hairy bodies facilitate the movement of pollen from flower to flower. They likely function as pollinators in local gardens as well as in the wild. The larvae of Bee Flies are predators or parasites of other insects, often the larvae or juveniles of ground-dwelling bees and wasps, butterflies/moths, grasshoppers, beetles, Neuroptera (lacewings, antlions) and other Diptera (flies, gnats, midges). Many Bee Fly larvae are generalist predators; they feed on several species, depending on availability. Eggs are often laid in or near insect burrows, providing the larvae with easy access to food.. While the larval food aspect can be alarming (particularly for those interested in conserving the solitary native bees), Bee Flies may actually play an important role in controlling populations of grasshoppers, beetles and other pest insects. They are a normal part of the local ecosystem, helping maintain the balance of plants, insects and other creatures. A functioning, sustainable garden ecosystem should also contain some Bee Flies, at least in dry areas like Southern California. A number of Bee Fly species are known from Southern California, particularly in the wilds. The best source of photos that we’ve found is Dr. Peter J. Bryant’s Natural History of Orange County and Nearby Places : http://nathistoc.bio.uci.edu/diptera/Bombyliidae.htm Unfortunately, local Bee Flies are not well-studied; so the number of species and details of their life history are poorly documented. While this lack of information is lamentable, it also presents a great opportunity for the observant citizen scientist. In our next posting (July, 2015), we’ll give some hints on photographing and studying pollinators. 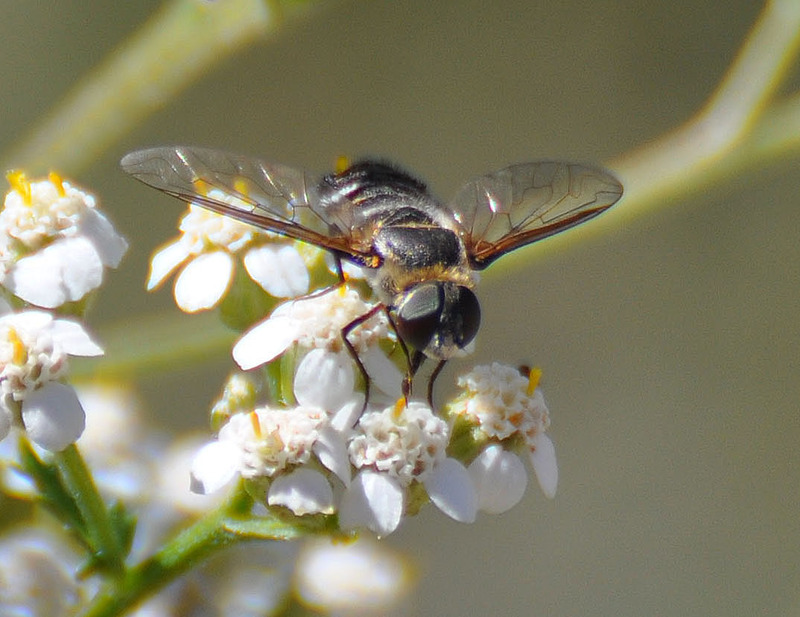 The Bee Fly species we see with some regularity in local native plant gardens is Villa lateralis. The genus Villa contains over 250 species, found on all continents except Antarctica. In the U.S., most Villa species tend to be western. Villa flies have rounded heads, clear or smoky wings with a distinctive, simple vein pattern, and a ‘chunky’ body with striped abdomen. The genus has not been extensively studied, and the last North American taxonomic review is over 100 years old . Hence, it may be difficult to key individuals out to the species level. In fact, the exact number of Villa species is not currently known. The local Villa lateralis (also known as Anthrax lateralis var. perimele) is widely distributed from North America to Panama, including Southern California. The species has variable morphology and can be difficult to classify. Individuals from Eastern North America appear to be distinct from those of the West. Local individuals we’ve seen have black bodies with prominent gold-yellow hairs on the thorax. The abdomen has alternating stripes of black, yellow-gold and white (see below). If you look closely you can see the different colored hairs on the stripes. The alternating colored stripes are the most distinctive feature seen with the naked eye. Note wing veins and stout proboscis. The wings of Villa lateralis have a simple, characteristic vein pattern (see above and http://www.drawwing.org/insect/villa-lateralis-wing). The proboscis is stout and not overly long – about as long as the width of the head. You can see it in the photograph above, as the insect sips nectar from a Yarrow flower. This species seems to favor plants in the Sunflower family (Asteraceae), at least in local gardens. We’ve observed them most often in June and July in native plant gardens. We’ve seen them feeding on late-blooming bush sunflowers (Encelia californica), common Yarrow (Achillea millefolium), Goldenrods (Solidago species and Euthamia occidentalis), Telegraph plant (Heterotheca grandiflora) and Goldenbushes (Hazardia species). 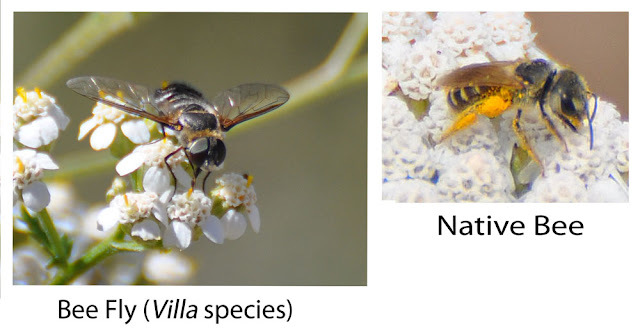 The Natural History of Orange County and Nearby Places has several photographs of Villa lateralis on Buckwheat (Eriogonum species) and Alkali heliotrope (Heliotropium curassavicum var. oculatum) flowers; we’ll need to look for them on these garden flowers as well. In a study in Oregon , Villa lateralis was found to be a specialist pollinator for several Asteraceae species (Erigeron foliosus; Eriophyllum lanatum; Haplopappus hallii; Solidago Canadensis). We suspect that it may be functioning as a pollinator in local wildlands and gardens as well. We hope some enterprising student will study this species in depth sometime soon! Very little is known about the larval foods of Villa lateralis in Southern California. The larvae of several species of Villa destroy grasshopper eggs; others are parasitic on caterpillars. But almost nothing has been published about this species in Southern California. If you know someone in search of a research topic, the life history of Villa lateralis is up for grabs! Learn more about the key role of pollinators: http://mother-natures-backyard.blogspot.com/2013/06/life-friendly-gardening-planning-for.html. 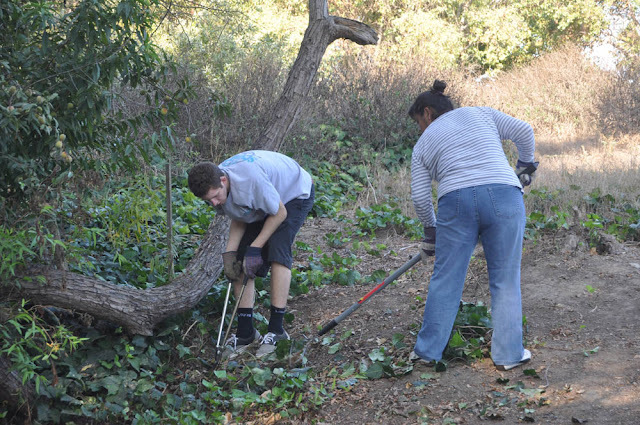 Volunteer for invasive species removal/restoration projects. Many local preserves & wild areas have regular restoration days and would appreciate your help. Find out which species threaten California. Use certified “weed-free” hay, seed, mulch, soil and gravel. Buy it where you burn it: Don’t spread forest pests by moving campfire wood from one place to another. Learn which invaders are in your local area. Monitor plants and trees for infestation symptoms. Report a Sighting - have you spotted an invader? Tell us where! Visit the Department of Fish and Wildlife’s Invasive Species Program web page (http://www.dfg.ca.gov/invasives/) to fill out a sighting report! Right now, some the prettiest flowers are in Mother Nature’s Garden of Health; in fact, it was hard to choose between them. But the showiest by far is Farewell-to-spring, Clarkia amoena. Of the three Clarkias we grow, this is the latest to bloom – truly ‘Farewell-to-spring’ or ‘Summer’s Darling’. To learn about our other Clarkias see: http://mother-natures-backyard.blogspot.com/2013/01/plant-of-month-january-purple-clarkia.html and http://mother-natures-backyard.blogspot.com/2014/05/plant-of-month-may-elegant-clarkia.html. Farewell-to-spring is native to the coastal plains and ranges of Northern California north to British Columbia, Canada. It generally grows in drier areas of its native range, making it a good choice for local gardens. Like our more local Clarkias, this species is an annual wildflower. 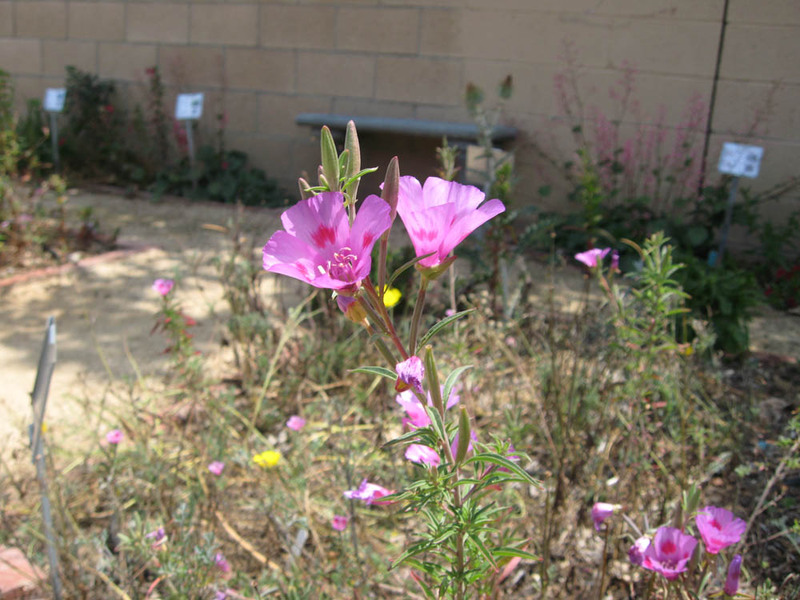 Many annual wildflowers like the Clarkias adapt well to garden life, even outside their native range. Farewell-to-spring germinates in our garden in spring, when the weather begins to warm up. The plants are many-branched with an open, somewhat stiff upright habit. The leaves are narrow, alternate and usually a medium green. The entire plant is 1-3 feet tall; in our garden Clarkia amoena is more robust than the Purple clarkia and more branched than the Elegant clarkia. 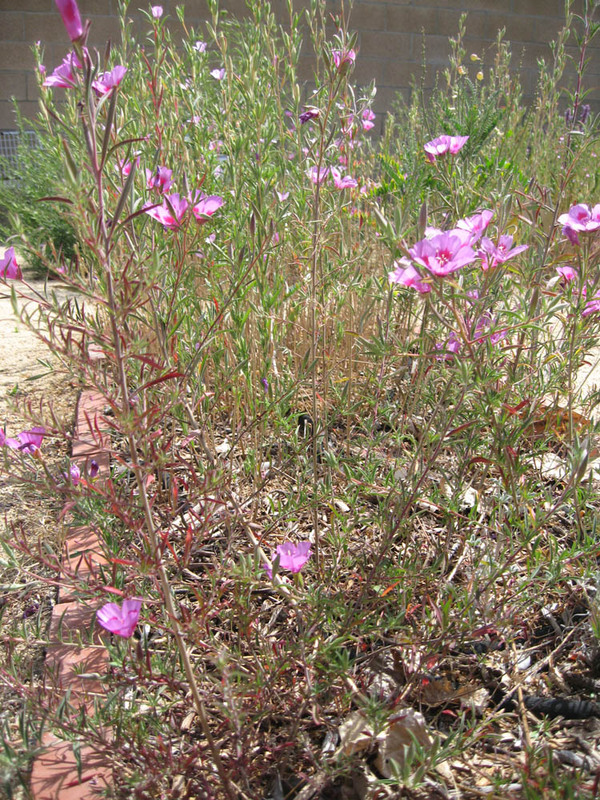 In its native setting, Clarkia amoena blooms from June until August – sometimes even well into fall along the Northwest coast. It usually flowers when other wildflowers and cool-season grasses are turning brown (see above). In Southern California gardens, it may begin blooming in May and will continue well into June or even July. 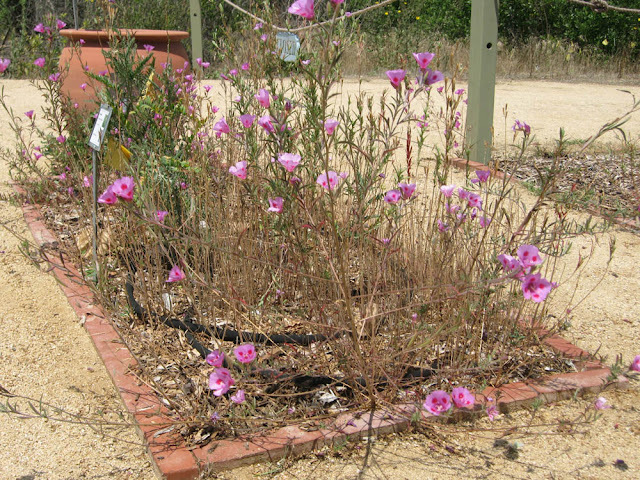 Flowering seems to depend on warm conditions, so a warm dry spring promotes earlier flowering. The bloom season can be prolonged by summer water. This is perhaps the loveliest of the native Clarkias. The flower color ranges from pale pink to bright magenta, ‘hot pink’, red and lavender. The four petals are most commonly pink with darker magenta splotches towards the center. The flowers in our Garden of Health (below) represent this common form. The flowers are approximately an inch across, with four petals characteristic of the Clarkias. The petals are satiny/shiny and extremely vivid and lovely; photographs rarely do them justice. The 8 stamens (male organs) are divided among four short and four long forms (the long ones are obvious in the left flower above; they appear to be ‘striped’ with pollen). The four fused stigma (female organs) are usually white and extend beyond the stamens (see the right flower, above). Bees are the most common pollinators (see native bee in above photo), although flowers attract other insect pollinators and hummingbirds. 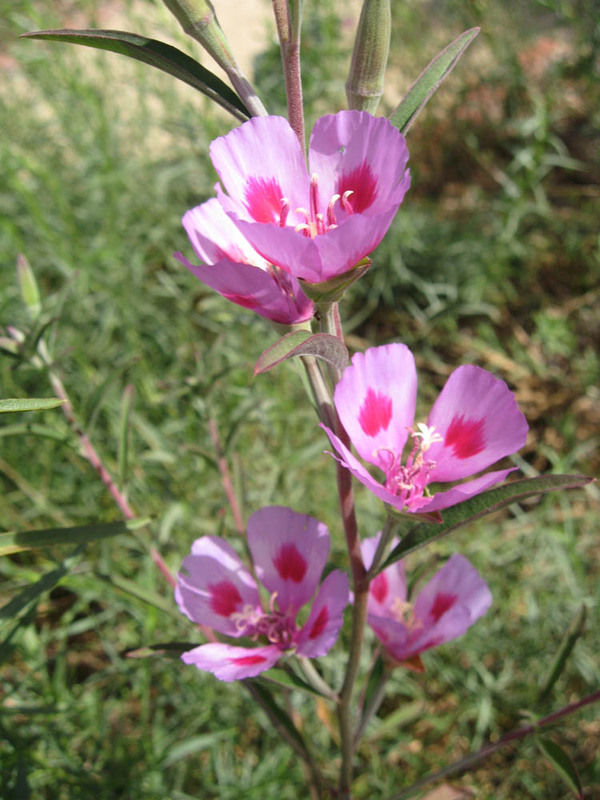 Like many native annuals, Clarkia amoena is not fussy about soil type, doing equally well in sandy or clay soils. 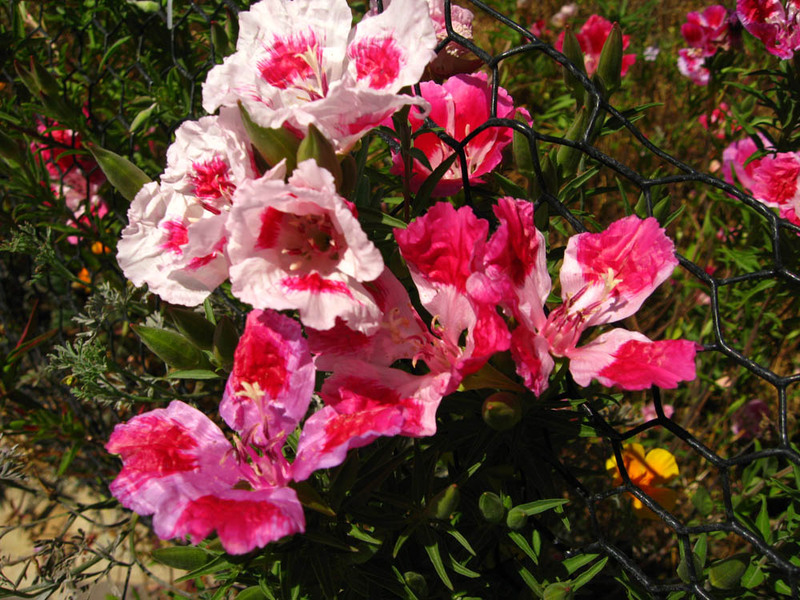 It blooms well in full sun, light shade or even part-shade (several hours of sun a day). It does need moist soils from the time of germination until it’s nearly ready to bloom. In dry winters, you’ll need to supply some extra water. 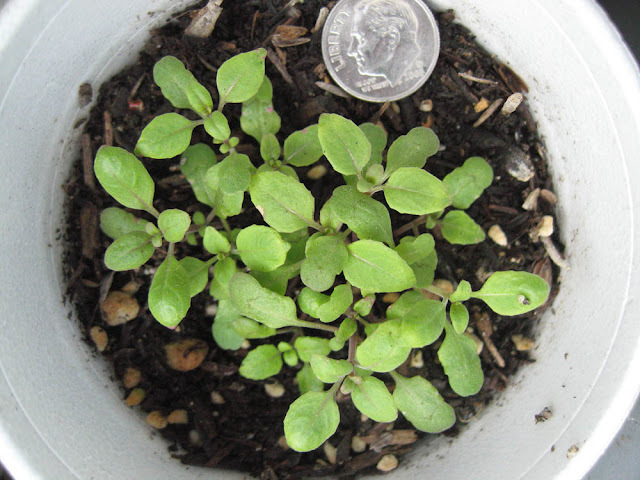 We sometimes (particularly when seeds are limited) start annual wildflower seedlings in pots. Clarkias can be tricky; plant them out when they are 4-6 inches tall and only when the soil is moist and temperatures are cool. Then be sure to keep them well-watered. It’s often easier to just sow the seeds directly in the garden. Plant them in winter, just before a good rain storm. Barely cover them, as they need light to germinate. And don’t worry about thinning the seedlings; they actually grow best when crowded (as they are in the wild). We let Farewell-to-spring self-seed in our garden. We allow the soils dry out as flowering ceases; then simply leave the seed pods on the plants to open and naturally reseed. 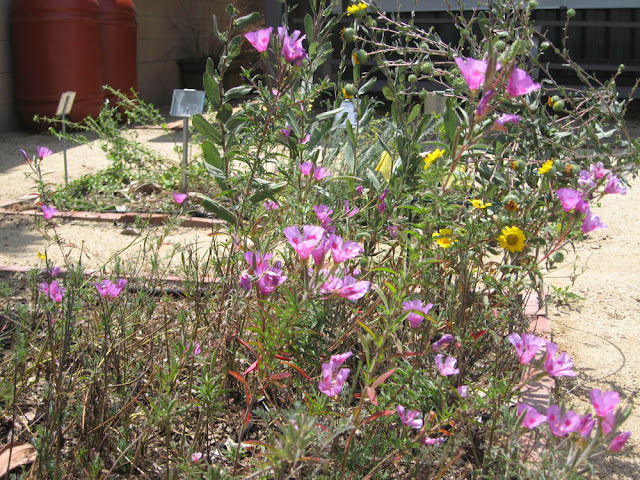 A thick layer of mulch is a common cause for decline of wildflowers over time. All Clarkias need bare ground, a thin gravel/sand mulch or a very thin organic mulch to come back year after year. We pull many a Clarkia amoena seedling from our decomposed granite (DG) pathways, which provide the perfect conditions for this annual. Like other native Clarkias, the seeds of Farewell-to-spring are tasty and can be parched and eaten as a pinole or used as a seasoning in baked goods, on salads, etc. The young plants can also be used as cooked greens (see http://mother-natures-backyard.blogspot.com/2013/02/california-gourmet-native-plants-for.html and http://mother-natures-backyard.blogspot.com/2013/03/california-gourmet-recipes-for-native.html ). 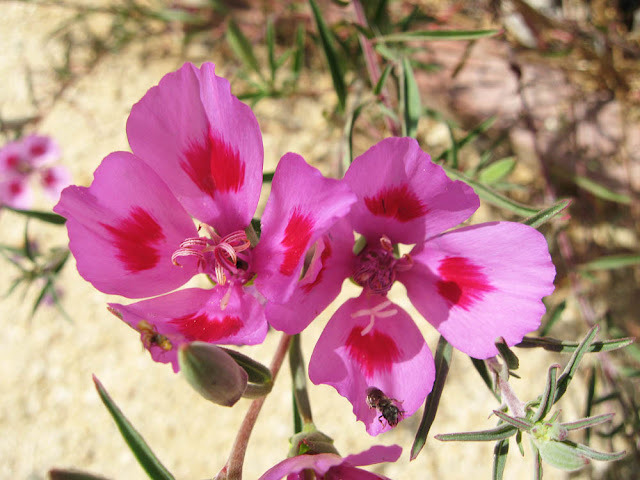 In summary, visitors enjoy Clarkia amoena each year in our garden. 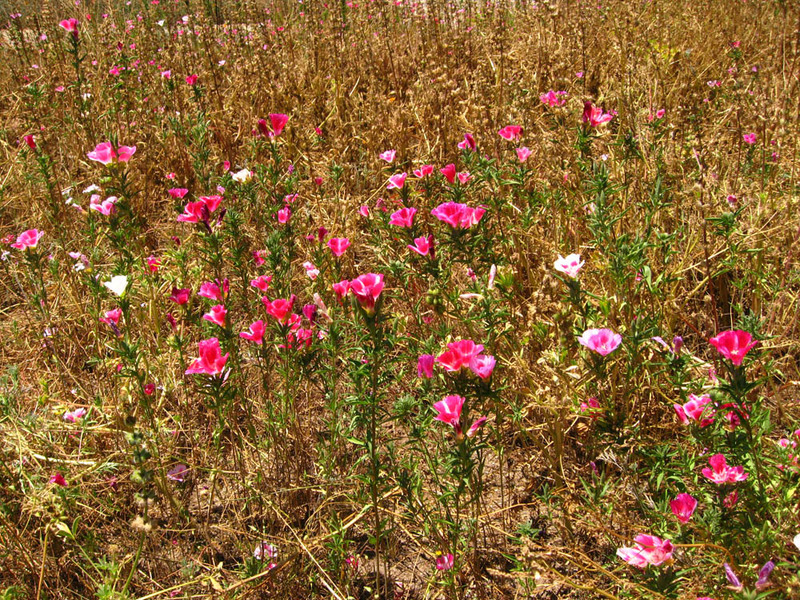 It provides a splash of bright pink color during the transition between spring and summer, when floral color can sparse. Like all annual wildflowers, it’s a useful filler plant, particularly in young gardens where larger plants have yet to reach mature size. And all Clarkias make wonderful cut flowers; in fact, some gardeners grow them for just this purpose. Consider including Farewell-to-spring in the summer flower garden, where it adds an old-fashioned charm. If you need a spot of summer color on a porch or patio, grow it in a container (at least 12 x 12 inches). Include it amongst the native grasses, where it contrasts so perfectly with the golden foliage. And consider including it in the vegetable garden; it will dress up the garden while attracting insect pollinators to your summer vegetables.